Newspaper, or something to protect your working surface. Be sure your glass piece is thoroughly cleaned inside and out. For a larger piece, where you can maneuver your hand inside the piece easily and spray, then you will spray inside piece. For smaller pieces, or for candle holders like I am doing ….I sprayed on the outside. There really is no difference in the final result. Be sure to shake the can well. Mist your piece with water….remember ..it must be a fine mist spray to work properly. You want small beads of water to form on the glass surface. Then quickly you follow with a light spray onto your piece with the Mirror Effect spray paint. The water droplets won’t let the paint adhere to those places, and that creates the old mottled Mercury glass finish. Do not worry if some of the spray paint and water run down the sides to the bottom, that’s normal. Wait five minutes for the paint to dry , then very carefully dab away any excess water and spray paint from the bottom with a paper towel, being careful not to hit the pieces sides. I’m spraying on the outside so I don’t have to do that step. I continued coating the piece first with a light mist spray of the water…then followed by a light spray of the paint. I continued doing this with 3-5 coats until it has reached your desired appearance. Do not get discouraged. It won’t look it’s best till you have a few coats of each on the piece. If your doing the insides of the glass, you can use some rubbing alcohol on a paper towel to carefully remove the over spray on the outside. Doing the outside of a piece like I’m doing..I didn’t have to worry about it. Look at the plastic the piece is sitting on. Pretty isn’t it…hmm…another idea is brewing. What I noticed with this particular spray from Rustoleum….it’s not shiny like the silver ones I have done in the past. Very matte. Here are some others I have done in silver that came out wonderful! 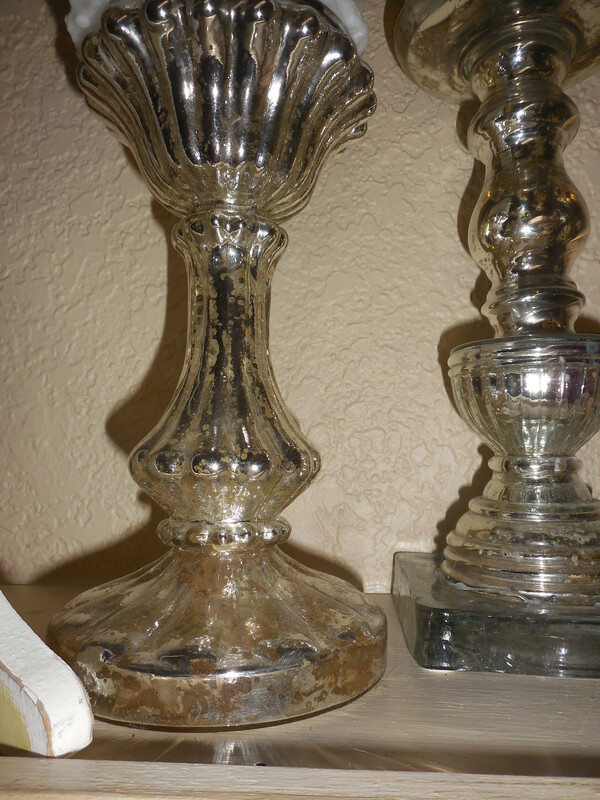 Both these candlesticks were done in the silver on the outside. Have fun now creating your own faux mercury glass. the votive s look so pretty with a candle inside. If you have any questions at all…don’t hesitate to ask. And…I would really love to see your creations when your finished…Thank you for looking! …and easy to do too! If mistake…alcohol removes. Wow I especially love the ones with more detail. Is there any problem with the paint rubbing off? I have to try this asap! Awesome job! It’s looks beautiful! Thank you Robin….this is one of those items that you can create yourself to look like the ones at PB for a huge amount less.